Sri Lanka scripted a historic win against South Africa in the first Test at Durban. Kusal Perera played one of the best Test innings while chasing, which helped the Lankans cross the finish line. In the 2018 IPL season, the Sunrisers Hyderabad had approached Kusal Perera to replace David Warner in the squad. The Sunrisers captain was officially suspended from IPL for that season due to a ball-tampering scandal. However, The Sri Lankan left-hander declined the offer, and also said that he would like focus on domestic first class cricket to regain his Test spot in the national side. He has 13 centuries in first class cricket and also recorded a triple century in 2013. The Sri Lankan team is currently playing a two-Test series in South Africa. The first Test between these two sides recently concluded at Durban. The visitors managed to bowl out their opponents for 235 runs, but they conceded a first innings lead. South Africa scored 259 runs in the second innings, and hence Sri Lanka had to chase 304 runs on a tough wicket. They were staring at defeat at one stage with 226/9, but a determined Kusal Perera took them to the win with a scintillating century, and also a record partnership for the last wicket. Everyone hailed this as one of the best innings in Test cricket history. 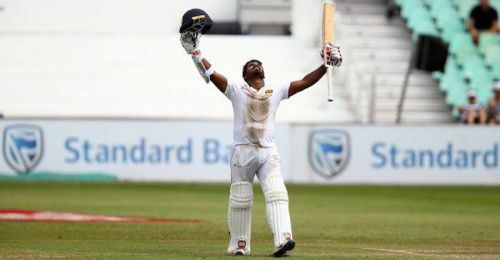 It's the highest score registered by a Sri Lankan in the fourth innings of a Test in a winning cause. People also recollected the incident about him refusing an IPL contract to focus on red ball cricket, which ultimately paid rich dividends. This is only the second Test victory for Sri Lanka in South Africa. The Lankans registered a Test win by one wicket only twice in cricket history with interestingly both coming against South Africa. The Sri Lankan team has been going through a rough patch in this transition period. Hence, this victory would be a huge morale booster for them. The second Test between these two teams will begin on 21st February at Port Elizabeth. The visitors would love to register their first ever Test series win in South Africa. Games like this and innings like this are great advertisement for Test cricket.